Maybe you knew that Dec. 24, 2018 was the 50th anniversary of Apollo 8, the first manned mission to the moon. 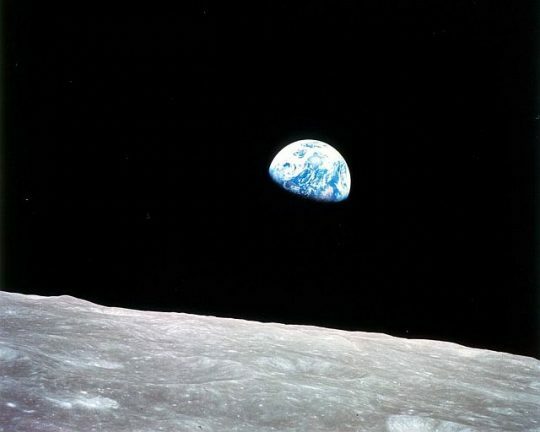 Instead of watching the moon rise from earth, Apollo 8 astronauts Frank Borman, Jim Lovell and William Anders saw the earth rising from the lunar orbit, photographed it and did a live broadcast. “The vast loneliness is awe-inspiring and it makes you realize just what you have back there on Earth,” Lovell said. It was Christmas Eve. The crew ended the broadcast reading from Genesis. Almost 50 years from that memorable date, the Adler Planetarium’s own crew, that of astronomers and other staff members, were considering what they could do to not just mark the Apollo 8 crew’s occasion, which they did with a program that included Lovell, but also put it into perspective with a program that wasn’t just one day or week long. The result is “Imagine the Moon,” a fun and exciting half-hour movie in the Grainger Sky Theater that includes Apollo 8’s earth-rising moments, the Apollo 11 landing with Neil Armstrong’s famed first words and a lot of literary and historic views of this orb that is Earth’s night light. “We wanted the audience to reconsider the Moon as an object in the sky. It is something we might notice but not really pay attention to, but our hope is that the audience will pay attention to it the next time they see it, be awed by it, and be inspired to consider what else they might have taken for granted in the sky,” said Adler Presentation Leader, Nicholas Lake, the movie’s writer. Among the interesting thoughts about the moon and even how to reach it that the show considers are mythological and early astronomical associations plus literary references and wishful attempts such as the use of a bullet and cannon. Indeed, Jules Verne’s From the Earth to the Moon 1865 novel told of a Baltimore gun club’s idea to build a Columbiad space gun to send the club’s president and two others to the moon. Beautifully illustrated, the show’s imagery was produced by Adler Director Patrick McPike and project animators using material from the Adler collection, the European Southern Observatory and such institutions as Harvard, New York University, and the Smithsonian. So, go. Sit back in the theater as far as you can, look up and enjoy. For ticket and other show information visit Adler Imagine the Moon or call (312) 922-7827. To see some of the stories in the show scroll down to exhibition. The Adler Planetarium is at 1300 Lake Shore Drive at the far east end of the Museum Campus.